It is not likely that you will hear an Analyst praise a company’s increase in average days payable. Nor will you hear a CEO boast about having an industry low DIO. It’s not even common that a company will go out of the way to alert you that their DSO is improving, even though that would mean they are receiving cash faster. While these metrics are far from popular, they form the basis for the calculation of the Cash Conversion Cycle or CCC. The Cash Conversion Cycle isn’t exactly a headline-grabbing metric in itself. It is primarily used by accountants and business operators to gauge the efficiency and internal performance of the business. While not a popular metric among investors, understanding it can give you a leg up on spotting an opportunity. In this post, we will discuss what the Cash Conversion Cycle is, how you can calculate it, and how you can use it to spot investment opportunities. Simply put, the cash conversion cycle tells us how long it takes cash to work its way through the business. A typical operating cycle for a business will start with cash which is then used to purchase inventory. After purchasing inventory, an invoice is received, and the inventory is paid for. Until the product is sold, the inventory sits in possession of the business. Once the product is sold, the business issues an invoice to the customer and eventually the customer pays cash for the product. Calculating the cash conversion cycle helps us understand how long it takes from the time the business shells out cash to pay for that inventory, to when the cash (and hopefully profit), re-enter the business via payments from customers. Why is this important? A company who can push cash through its operating cycle faster can reinvest that cash more often. If your business has a shorter CCC than your competitors, you can grow the company at a faster rate without having to rely on capital markets. The Cash Conversion Cycle is calculated by adding together the Days Inventory Outstanding (DIO) with the Days Sales Outstanding (DSO) and subtracting the Days Payable Outstanding (DPO). To truly understand the CCC, it helps to visualize the typical series of events and corresponding calculations. The first event occurs when the business purchases inventory. From the time the business receives the inventory to when cash leaves to pay for inventory is the period used for calculating the Days Payable Outstanding. A business can delay payments to improve this number. Sometimes a delay in payment might mean a company is struggling financially, other times it could indicate management is working on financing its own growth. To calculate Days Payable Outstanding, we take the accounts payable divided by the COGS and then multiplied by 365 (days of the year). If we want to calculate a specific period, we can take the Average Accounts Payable divided by the COGS per day. The Average Accounts Payable is the beginning accounts payable added with ending accounts payable of the period and divided by two. Once a business has received inventory, they need to sell it. A business that has lots of inventory sitting around is essentially parking cash in that portion of their operating cycle. The time the inventory is received to when the product is sold is referred to as the Days Inventory Outstanding or DIO. To calculate Days Inventory Outstanding, we take the Inventory divided by the COGS and then multiplied by 365 (days of the year). If we want to calculate a specific period, we can take the Average Inventory divided by the COGS per day, and multiply the number of days. The Average Inventory is calculated by adding the beginning inventory and ending inventory and dividing by two. Simply selling a product isn’t enough. The business needs to collect the cash from that transaction. Some firms give incentives like discounts to entice their customers to deliver cash to them faster. When this cash comes in faster, the business can reinvest it in the business to further drive the operating cycle. The period between when the product is sold and when the cash is collected is referred to as the Days Sales Outstanding (DSO). To calculate the Days Sales Outstanding, we take the Accounts Receivable and divide by the Revenue, followed by multiply by 365 days. If we want to calculate a specific period, we divide average accounts receivable by revenue, multiples by the number of days in that period. Average accounts receivable is calculated by adding the beginning accounts receivable and endings accounts receivable, divided by two. Finally, when a business evaluates the time between paying for the inventory and receiving cash, a true cash conversion cycle can be calculated. The CCC is derived by adding the day's inventory outstanding with the day's sales outstanding and subtracting the days payable outstanding. The cash conversion cycle can give you valuable insight as an investor. For example, if you come across an industry that you like but are having a hard time differentiating superior management, compare the CCC of both entities. You can also use the components of the CCC to spot management tactics or overall improvement in operations. Each metric can hold valuable insight into what is happening within the business. Days Payable Outstanding - An increase in DPO means a company is keeping cash longer when paying their bills. Typically this is a good thing and means the business has favorable terms with its suppliers. However, if you have reason to believe the company is in trouble, pay careful attention to this number as an increase might indicate the business is delaying payments to survive. Days Inventory Outstanding - An increase in DIO means the company is struggling to sell inventory. If industry peers are not experiencing a similar dip, this could be an area that you want to investigate further. On the contrary, a decrease in DIO signals inventory is moving faster. If the firm is significantly outperforming industry peers, they may have a superior logistical advantage or seeing success from another business operation tactic such as marketing. Once you identify the reason in the lower DIO, you can analyze the possibility of it being a sustainable advantage. Days Sales Outstanding - An increase in DSO means the company is receiving cash from clients at a slower rate. It could be something as simple as a change to accounting procedures such as when invoices are sent and collected, or it could be something more drastic like a cyclical downturn. A decrease in DSO indicates the business is receiving payments faster. Generally, this is a good thing. 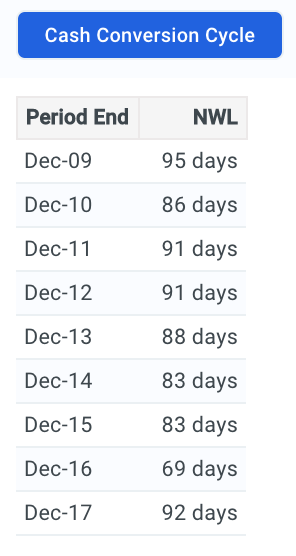 Overall the patterns you want to see in a company are an increase in days payable outstanding, and a decrease in both days inventory outstanding and days sales outstanding. This creates a lower cash conversion cycle. The lower the CCC, the better. If you are on the hunt for possible value oriented companies that the market has failed to appreciate, you can start your search by identifying businesses with a better performing CCC than the industry average. Using the Finbox Screening tool, you can first identify the average CCC by sector, and then screen for candidates who beat that mark. Remember, a lower cash conversion cycle is better so you will want to screen for candidates with a CCC less than the average mark. Another tool that you should use is the Finbox Data Explorer. 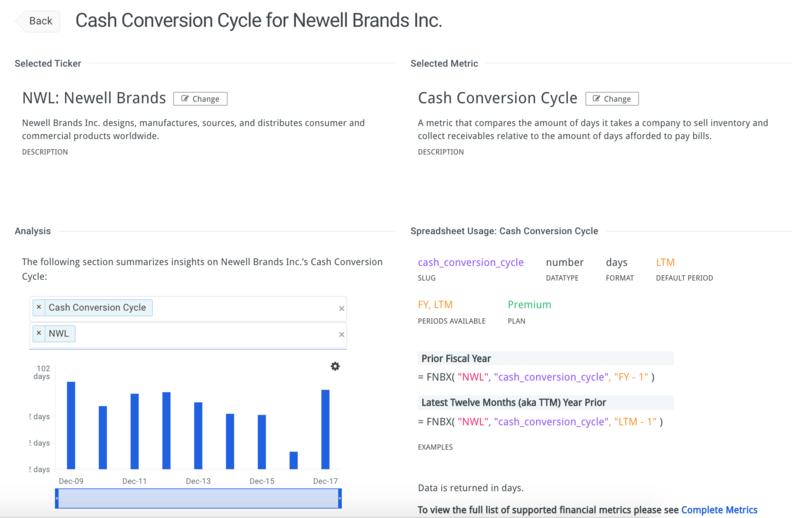 This will allow you to type in a specific metric (cash conversion cycle for this example), and see in-depth details on how the company shapes up. It also gives you a unique perspective of the historical CCC trend and a snapshot comparison to industry peers. 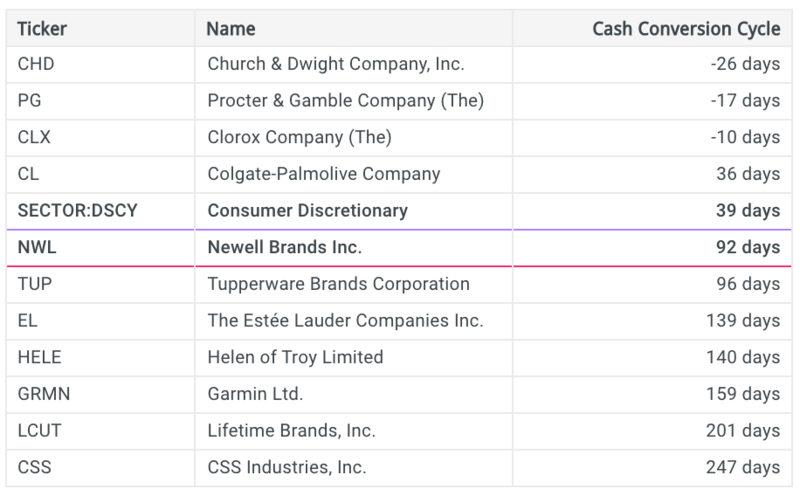 Finally, if you want to dive deeper in analyzing cash conversion cycles, use the Finbox Excel or Google Sheet extension to make a CCC dashboard. I like making a table comparing the multiples among industry peers and breaking it down to a portion that allows quick an easy analysis of the DSO, DIO, and DPO. Adding both a trailing twelve month and current year metric also gives you a comparison of any change and improvements. Overall, the cash conversion cycle can be an interesting an informative metric to analyze investment opportunities.